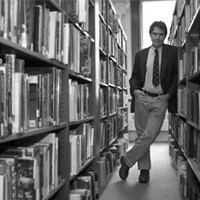 If you have any resemblance to bibliokleptomaniac Stephen Blumberg, you have an intense love for books. Blumberg’s obsession led him to multiple arrests in the 1980s and early ’90s for his theft of over 20,000 rare books from over 140 universities in 45 states and Canada, and to custom-build 86 bookshelves that extended over windows and into the backs of closets to house his collection. Though Blumberg’s case is extreme, to many nothing can compare sharing their home with their favorite authors and characters, breathing in the distinctive smell of worn paper, and turning each individual page as the words seemingly float away into space. If you’re looking to surround yourself with books like Blumberg (through legal means), or just searching for some new titles to curl up on the couch with, grab your biggest tote bag in preparation for the third annual Spencertown Academy Arts Center Books Festival, which will be held over two weekends, from September 5 through September 14. Over 10,000 donated new and gently used books will fill the building. “The important thing about the number is that they’re 10,000 quality books,” says Mary Anne Lee, executive director of Spencertown Academy. “We get rid of the junk and the pulp novels and and the bodice-rippers. They are all very well organized and it’s easy to shop.” Though Lee explains that all genres and books for all age groups will be available, and that event organizers have a strong collection of art books, biographies, political nonfiction, and paperbacks in contemporary literature. Some of the authors participating in panel discussions and reading from their books this year include Russell Banks (author of The Reserve, Dreaming Up America, and Cloudsplitter) and Mary Gordon (author of Circling My Mother, Final Payments, and The Shadow Man). Also, authors Da Chen, Rigoberto Gonzalez, and Sadia Shepard will lead a key panel discussion on the immigration theme on September 6. Chen, author of Brothers, China’s Son, and Colors of the Mountain, grew up in southern China during the Great Proletarian Cultural Revolution, in which families, including his own, were forcibly placed into re-education camps by the emerging communist government. Gonzalez, foremost known as a poet, has also written memoirs, including The Butterfly Boy, about his experience as a double outsider: as both an immigrant in the US and as a gay man in a macho Latin culture. Sadia Shepard’s The Girl from Foreign recounts the Pakistani author’s discovery of her Jewish heritage. The festival will also have activities for children, as one of the art galleries downstairs will be devoted to the sale of children’s books. There will be visits by children’s book authors and illustrators including Marc Teague, a local author/illustrator of over 20 children’s books including First Graders from Mars, How Do Dinosaurs Say Good Night?, and Pigsty. There will also be a “Breakfast with Clifford the Big Red Dog,” story time, and arts and crafts. During the run of the festival, an art show by Buzz Spector will also be on view. Spector, an art professor and the art department chair at Cornell University, is known for his interest in using text and books in his artwork. In the past, his artwork has involved tearing the pages of hundreds of books to create a cascading staircase with their bindings; transforming a book of paintings from a six-sided object to a five-sided one by making its covers come to a point; and printing single lines of a poem onto separate pencils so the lines could be rearranged. The Spencertown Academy Arts Center Books Festival will occur on two weekends from September 5 through September 14. A preview party will be held on September 5 from 6 to 8pm. (518) 392-3693; www.spencertownacademy.org. Photo of Sadia Shepard by Andreas Burgess. Shepardâ€™s The Girl from Foreign recounts the Pakistani authorâ€™s discovery of her Jewish heritage. Photo of Da Chen by Barbara Gentile. Having grown up in China during the Cultural Revolution, Da Chen will participate in a panel discussion on the immigration theme on September 6.